Arrival: Welcome to the Galápagos! After arriving to the Galápagos Islands, you will be met at the airport by your private transfer. Afternoon: Check-in to your boutique hotel, and enjoy a free afternoon ( we suggest visiting the nearby Charles Darwin Station), before settling down for a delicious welcome drink and dinner at the hotel. The Galápagos consists of 13 major island and 6 smaller ones, and you will explore many of them over the course of your stay. Dinner: Enjoy a late lunch or early dinner at Semilla Verde Hotel as you enjoy your first evening in the Galápagos. Morning & Afternoon: At 7:00 in the morning you will be picked up at your hotel and will depart by boat to Bartolome island (enjoying your breakfast on the boat). Bartolome Island has a spectacular volcanic landscape and great snorkeling! Climb up a long staircase to the view point on the summit offers breathtaking views over the surrounding islands. Bartolome is famous for its Pinnacle Rock – probably the most famous volcanic landscape in Galápagos. This beach is great for swimming and snorkeling with the opportunity of seeing many different reef fish, penguins, rays and white-tipped reef sharks. 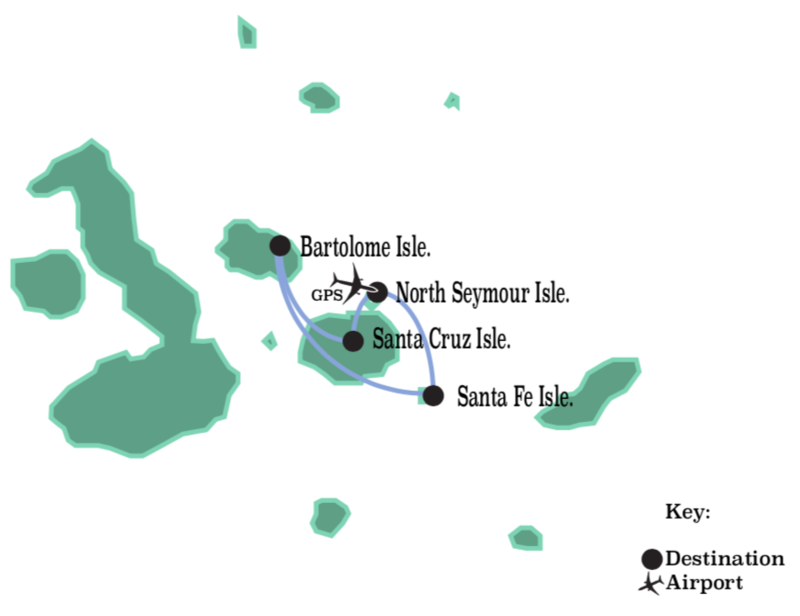 Enjoy a full day on Bartolome Island (with both a land visit and snorkel activities). Return to Semilla Verde around 5:00 in the evening. Evening: Return to Semilla Verde around 5:00 in the evening. Overnight at Boutique Hotel. Morning & Afternoon: At 8:00 in the morning you will be picked up at your hotel and will depart on a day trip to North Seymour Island where you explore the island by both land and sea. Located slightly to the north of Baltra, North Seymour is a low, flat island, formed as a result of the uplift of a submarine lava formation. It is covered with low, bushy vegetation and contains the largest colony of Magnificent frigate birds in the Galápagos. Land iguanas are common here too. There is also a population of blue-footed boobies that perform an amusing courtship dance when nesting conditions are right. This goofy stride, picking-up high their blue feet in a slow motion, wing spreading, whistling and honking is one of the highlights of a visit to this island. Snorkeling and swimming from the beautiful and sandy Bachas beach follows the walk. Evening: You will return to Semilla Verde around 4:30 in the evening. Overnight at Boutique Hotel. Morning: At 8:30 in the morning you will be picked up at your hotel and depart out on a Highland Tour of Santa Cruz island (cloud forest, pit craters, lava tunnels, wild tortoises). Return to Semilla Verde around 2:00 in the evening. Lunch: Return back to the hotel for lunch at Semilla Verde, followed by a free afternoon and evening. Evening: Enjoy a free evening to explore the nearby town and eat dinner at a restaurant of your choice. Morning: At 7:30 in the morning you will be picked up at your hotel and embark on a day trip to South Plazas or Santa Fe Island (land visit and snorkel activities). One of a pair of small uplifted islands a short distance from the east coast of Santa Cruz, South Plaza has a unique landscape of colourful Sesuvium plants and Opuntia cacti and provides some of the most interesting wildlife observation spots in Galápagos. Land iguanas are easily seen from the trail. Swallow-tailed gulls, Pelicans and Shearwaters, along with other sea birds use the rising air to glide effortlessly over the escarpment. The protected rocky seashore is prime habitat for a large colony of playful sea lions. Located south of Santa Cruz Island, Santa Fe Island offers the chance of spotting the Santa Fe Land Iguana, that only exists here. Arriving on the sandy beach of a protected bay you will be greeted by tens of sea lions and lava lizards. A short circular trail takes you along the cliff edge where you can most likely spot the iguanas. Snorkeling in the beautiful bay here offers playful sea lions, colorful reef fish and occasionally sea turtles and rays. Dinner: You will return to Semilla Verde around 4:30 in the evening. Return to Semilla Verde to enjoy a relaxing evening and delicious dinner. Morning: After we check out of our hotel we will travel to the airport to catch our International flights back home or to our onward destinations.